Looking for guidance on how to hang a picture? 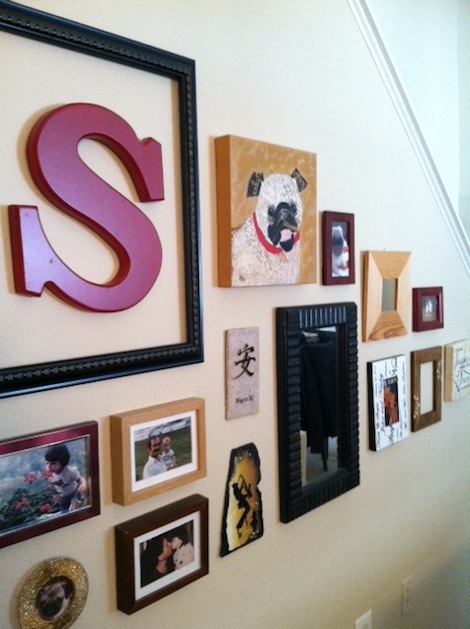 Here's detailed instructions on the best way to organize photos on a wall and gallery wall ideas. Below you'll find detailed instructions for hanging a gallery wall and ideas for different layouts as well as some products like picture hanging hardware that will help. Happy reading! This is my gallery wall! Below I detail how to hang a mirror, pictures and wall art like I did here. Have fun with it! Pick out your wall art. Now that you know how much wall space you have to work with, it's time to choose what you will hang up. 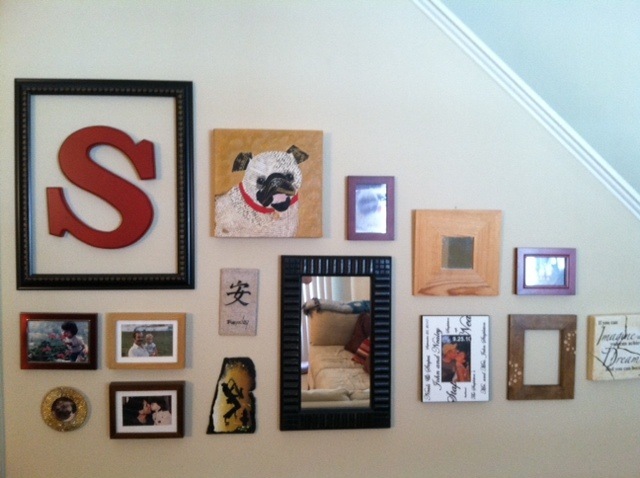 What is this gallery wall supposed to express? Family photos showing the generations? Different pieces of artwork that inspire you? Both? Gather all of your desired pieces, and get creative with it. Things to consider other than which photos you want to display are factors like colors, frames and dimensionality. Remember, choosing colors that complement each other can bring photos and artwork together, no matter how different they are. As you can see in the photo above, I included canvas art in my gallery. 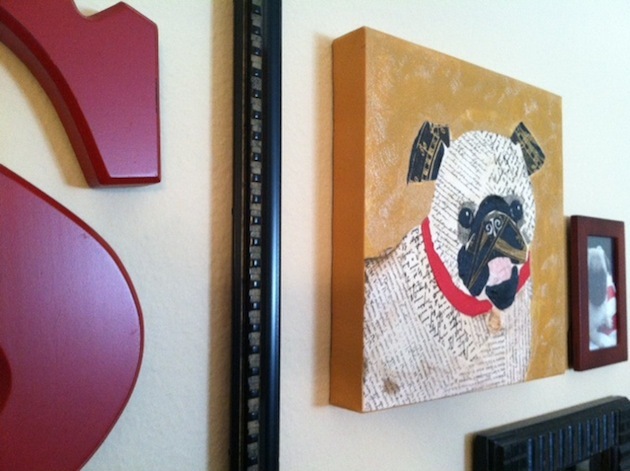 I love the dimension it brings to the wall (and obviously we love Pugs!). 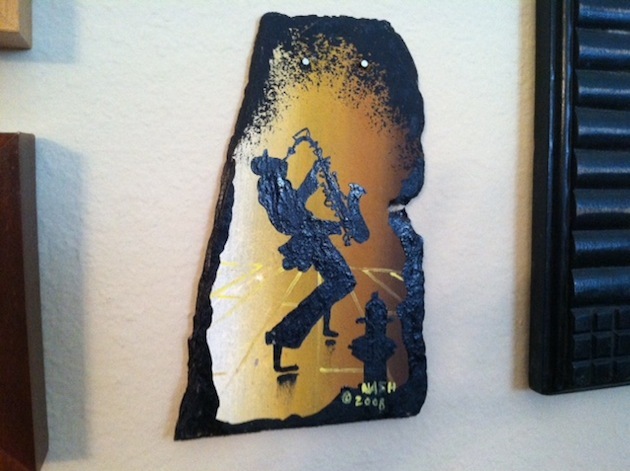 Here's another feature to consider: the material or medium that the artwork is on or the frame is made out of. This painting is on a piece of slate. Very cool! 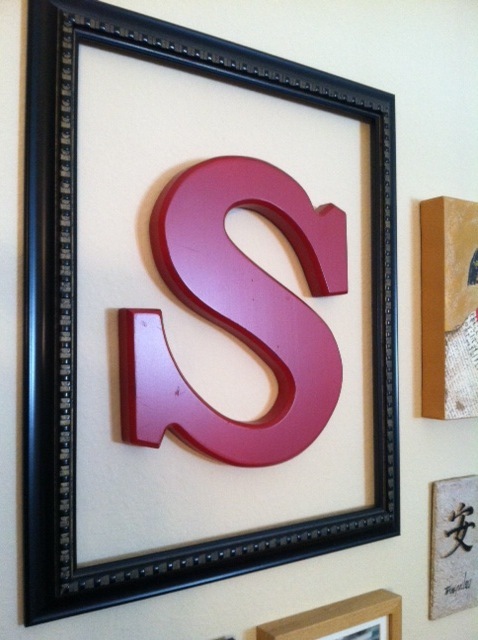 Here's another piece of wall decor with dimension: a 3-dimensional S and an empty frame around it. As you can see, I included canvas art, a 3-dimensional letter, empty frames, mirrors, different mediums AND photos in my gallery wall. What brings all these different characteristics together are the colors. Lay it all out. 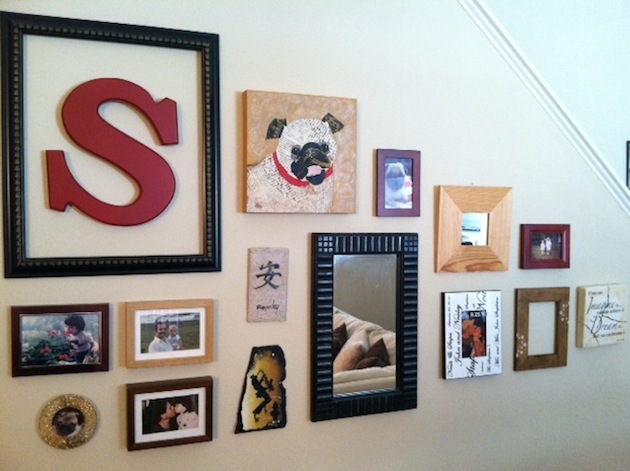 There are several ways to design the layout of your gallery wall. One of them, and this is what I did, is to lay everything out on the floor in the desired arrangement. This way you can see how the pieces look together and move things around until it looks the way you want it to. You can also purchase picture hanging systems that give you removable wall templates to work with, so that you can lay it all out on the actual wall or easily create something like this yourself. There are so many ways you can layout your gallery wall, so here are some more ideas and inspiration for you on how to hang a picture. Hang it up. Once you’ve got all your desired wall décor picked out and in the desired arrangement, it’s time to hang everything up. Start with one piece and work your way around. In my case, I started with the biggest item on the very left and then worked my way to the right. If you have a central piece, then perhaps hang that one first and work your way around it. Be mindful of how your pieces need to be hung and that they can be very different. For example, some frames have picture wire in the middle while others have a small metal loop at the top. Now you know how to hang a picture and create a gallery wall, so there's only one thing left to do. Celebrate! Trying to figure out how to hang pictures level and straight on the wall? Here are some great products that will help with that as well as some general picture hanging tools. Need picture hanging hooks? These are the top-rated products on Amazon. Take a peek! This kit comes with the frames, the mattes and templates to layout your gallery wall. It's an awesome help if you're trying to figure out how to hang a picture and the best way to organize photos on the wall. Check it out! This tool marks exactly where the nail should go AND has built-in levels to ensure what you hang up is straight. If you're renting or you don't want to put holes in your wall for any reason, consider using adhesive strips like these. Need some picture hanging hardware? Check out this kit that comes with it all!